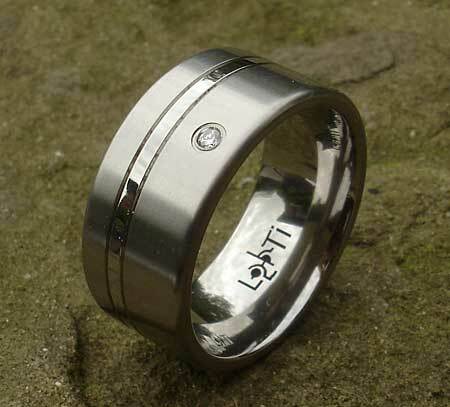 Men's Titanium Diamond Wedding Ring : LOVE2HAVE in the UK! 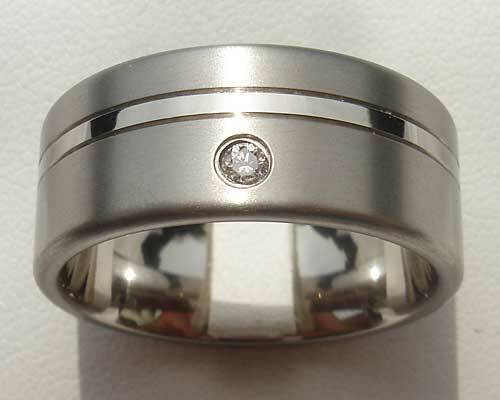 A flat profile 10mm width men's titanium diamond wedding ring with two off centre grooves and set with a 6pt (2.5mm) brilliant cut diamond (SI - G/H quality). The ring comes in a choice of all polished, twin (polished stripe and satin main - pictured) or all satin. Please state your pick in the comments box at check out. We also do another version in a 7mm width and even with a black diamond, so if you are interested in any or both of these options, please contact us, and we will be able to help you out. The ring of choice for a diamond wedding ring is platinum, but realistically this is out of most people price range these days which is why we find our selection of diamond titanium rings to be the most popular choice for our customers. We feature a wide variety of modern styles suitable for all occasions, but this one is particularly popular. Precious stone(s) Available: 1 x 6pt (2.5mm) diamond. Finish(es) Available: Polished, satin or combination.